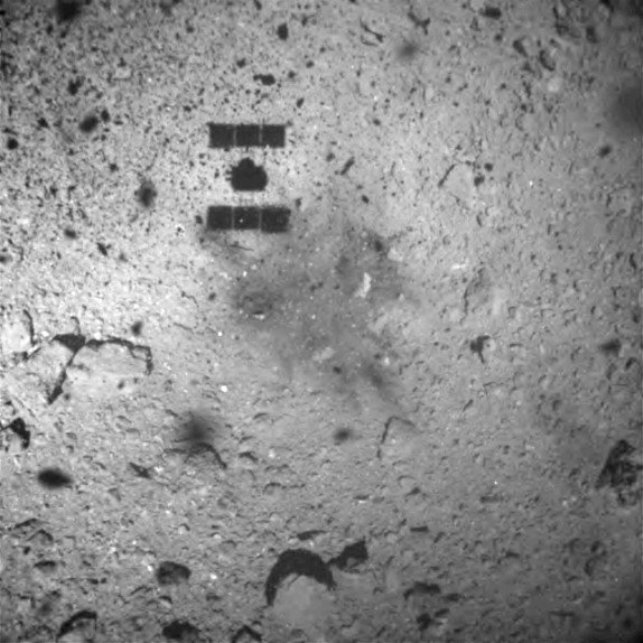 Japan’s Hayabusa 2 spacecraft successfully touched down today on asteroid Ryugu, more than 200 million miles from Earth, during an operation aimed at blasting away and collecting a sample from the space rock. The 18-foot-wide spacecraft was programmed to extend a yard-long tube to touch the surface, shoot a bullet made of tantalum into the asteroid and collect the bits of rock and dust thrown up by the impact. In a series of tweets, the mission management team said telemetry confirmed that the bullet was fired and that the spacecraft was heading back to its stationkeeping position, 12.4 miles (20 kilometers) above the asteroid. This entry was posted in GeekWire and tagged Asteroids, Hayabusa 2, Japan, Ryugu, Space. Bookmark the permalink.